I recently updated Mila’s bedroom which you can now see in our catalogue (on issuu here), and made a few changes to show you how to create a French style kids bedroom for very little money I think. Stylish French homes love grays and the ones I mostly use at home, are from Farrow & Ball. When we moved in three years ago, the first thing I did, was to paint all the floorboards and the walls in white (except the one behind her bed which I painted in Down Pipe). To soften the whole look, I then painted her wardrobe in light gray. I can’t remember whether I used Pavilion Gray or Lamp room Gray because I used gray in our bedroom at the same time but it doesn’t really matter as you should always get a a few samples first to try different grays on your walls and see how they look in your room at different times of the day. Then I created little vignettes in each corner of her room. Needless to say that her choice of toys (bright pink and 100% plastic) differs from the toys and accessories I like to buy for her room (handmade, wood, vintage) but I tried to achieve a balance & find storage solutions so she can have her toys with I can have her bedroom looking nice and visually pleasing. I used a lot of cotton bags (you know the ones fashion shops give for free with your purchase) and I store her socks/swimming gears/headbands in various bags so each bag has a purpose but at the same time, they all look very pretty together. 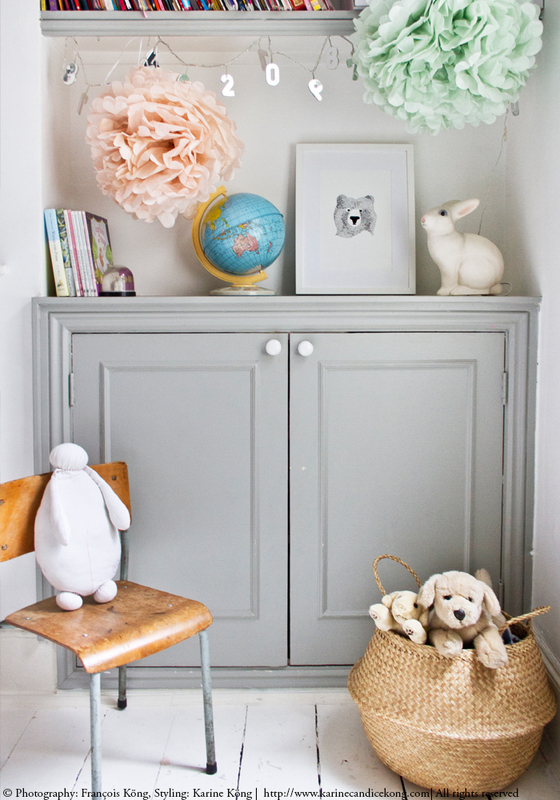 The other great piece of decoration I think which adds instant value to a room are these paper pom poms which you can also use for a party, birthday or to brighten up a corner of your home. On this photo, I used the bright version for a photoshoot and you can see how much it changed the look of Mila’s bedroom. I would love you to translate the posts if it’s not too much extra work. I’ve been missing it! English is my first language, but I always read the French version of your posts first to keep up my French (which is getting rusty since I moved to the UK…). Don’t let a pernickety translator put you off!! I’m also English and love reading your French posts to keep up my vocab! I’m happy with large file sizes for images when reading via iPhone cos I usually access via our wifi – I hate low-res fuzzy images. Mila’s bedroom is gorgeous, très chic!